Best Scenes of the Observatory. Please enjoy this selection of pictures of the observatory telescopes and buildings in their beautiful surroundings. From top to bottom, the Domeless Solar Telescope, the dome of the 65cm refractor tele., the dome of the 60cm reflactor tele., the main building for lodging and dining, and the Solar Magnetic Activity Research Telescope. 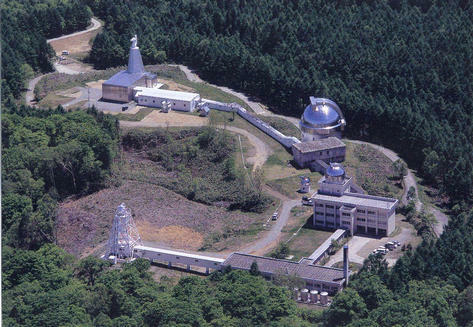 Click the photo and enjoy scenes of the Hida Observatory. 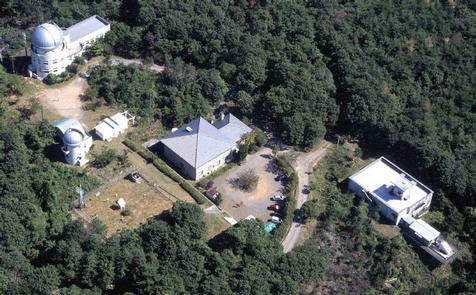 From left to right, the main building, the annex, the museum, the new building, and the Taiyo-kan. Click the photo and enjoy scenes of the Kwasan Observatory.